Home | Recipes | Lentil Dhal with Coconut Curry Chutney. Lentil Dhal with Coconut Curry Chutney. I used yoghourt with coconut for this recipe and was a great hit with the family. Heat the oil in a saucepan over a medium heat; add the onion, garlic, ginger, turmeric, chilli powder and cardamom pods. Cook, stirring, for 5 minutes or until the onions are golden and the spices are aromatic/fragrant. Add the tomatoes; cook for a further minute before adding the lentils, chickpeas and cooked pumpkin and vegetable stock. Cook a further 5 minutes. Stir the coconut milk and coconut yoghourt through the dhal. Make coconut curry chutney: Put the coconut, green chillies, ginger and a generous pinch of salt into a small food processor or blender and process to a fine paste. Transfer the mixture to a bowl. In a small frying pan, heat the oil over a medium heat and, when hot, add the mustard seeds and curry leaves. As the mustard seeds begin to pop, add the coconut mixture, then lower the heat and cook for 5 minutes, stirring occasionally. Remove from the heat and set aside to cool. Fold the coconut yoghourt through the cooled coconut mixture; transfer to a serving bowl. Add a generous dollop to the Lentil Dhal and enjoy. Notes... If you are not a fan of curry leaves or simply just do not have any by all means use curry powder ...recipes are for experimenting with and creating your own likings. Hubby is demolishing concrete this weekend so the added turmeric in a meal is great for his joints and arthritis. Comforting, warming and very tasty. 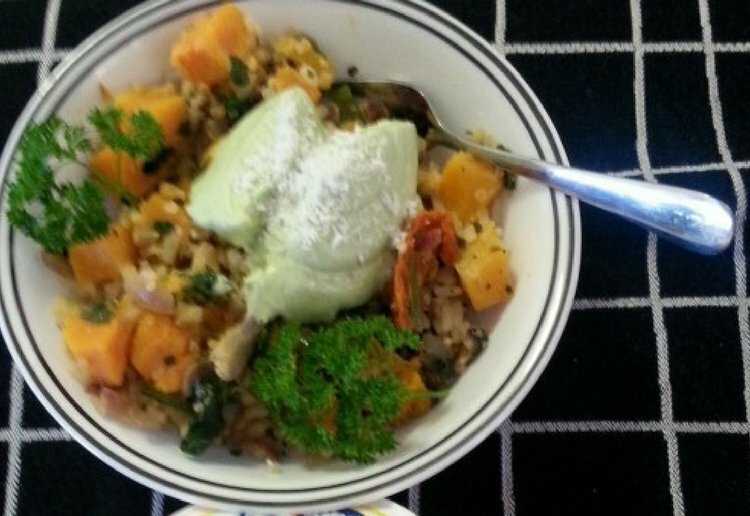 Thanks again Cherz – this is a delicious recipe for lentil lovers. Always love your recipes Cherz and the presentation of the all the completed recipes are always of such a high standard!